The wild, swinging ’60s spy adventure is back! 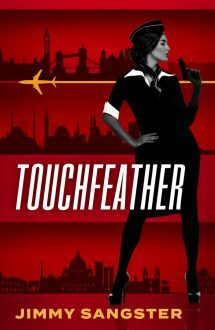 Katy Touchfeather is a carefree, red-headed, airline stewardess who is actually a top British spy. She’s lethal, seductive, and as ruthless as any double-O. Her latest assignment is to track down a scientist suspected of selling secrets to the Russians. It’s a high-stakes, global escapade that takes an unexpected violent turn that shatters her life…and ultimately pits her against a billionaire industrialist with terrifying intentions. Sangster’s novel may seem like a satire to the uninitiated. But it only takes a few opening pages to realize that it is a genuine spy novel – with a unique, and noticeably unusual female perspective. TOUCHFEATHER presents an entertaining and refreshingly different take on the male-dominated world of spy fiction. This book is a true product of the Swinging '60s, and Brash Books is bringing it back into print in January, complete with a trigger warning at the beginning. Times and attitudes have changed that much. Touchfeather's breezy narration carries the story right along, and while she makes mistakes, she's efficient and tough when it counts. These light adventures are quite enjoyable and are spy fiction first and foremost. I'm every bit as smitten with Miss Touchfeather as she herself would naturally expect me to be. Pretty darn fun. Katy Touchfeather is an operative for a secret British organization. Her cover is she’s an air stewardess, and believe me this book is from an era long before the more acceptable terms ‘cabin crew’ or even ‘flight attendant’. Katy is skilled with both her fists and a gun, but her biggest asset is her feminine wiles. She never needs a guy to ride in and rescue her. It would be nice to see Katy fly again. This abundantly revelatory memoir of an English air stewardess who has an in with Intelligence is a rousing and riotous recital that covers most of the world.